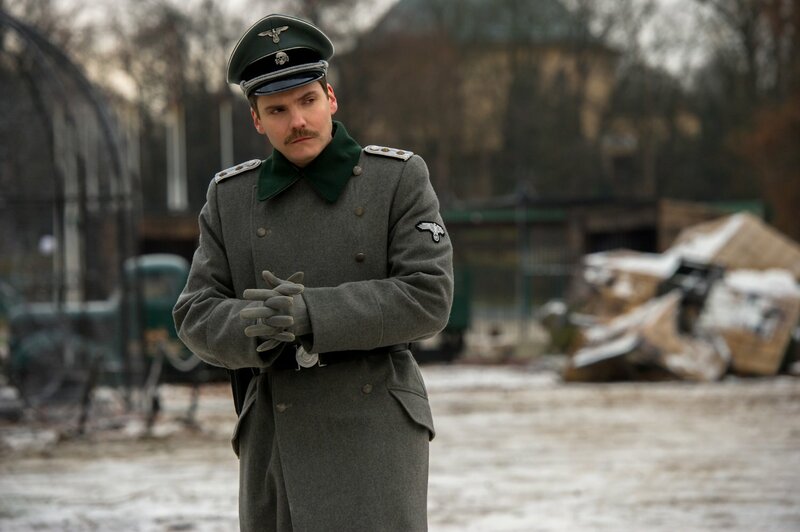 American audiences will recognize Jessica Chastain of course, and they may even know Daniel Bruhl, who I recently raved about in my review of Alone in Berlin. But Johan Heldenbergh might not be someone you’ve seen before, and that’s a shame. I can’t claim higher ground, I’ve only seen him one time, in The Broken Circle Breakdown, a powerful film in which he shone. And his light radiates again here in a film that isn’t his vehicle, but which he steals whenever he is on camera. He & Bruhl duel for the attention of Chastain, which is one of the themes of the movie, though not its primary by any means. But that subplot does pit these two fine actors against each other, and I think it, along with the true story behind the action, saves the film from potential ruin. 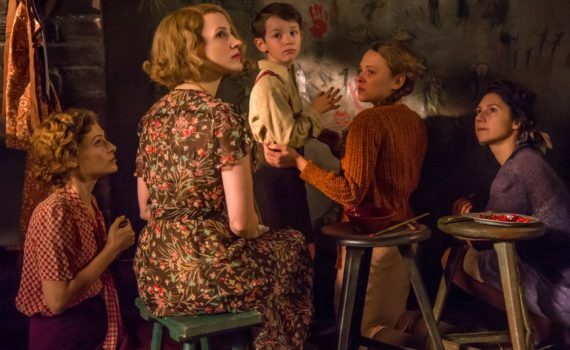 Based on the book by the same name, The Zookeeper’s Wife tells the true story of the Zabinski family, their zoo, and their heroic acts during the Nazi occupation of Warsaw, Poland during WWII. The Zabinskis ran the Warsaw Zoo with care and dedication, loving the animals as their own children, forming relationships that went beyond humans and animals. Antonina was as hands on as possible, living among the creatures, helping them through struggles, viewing each of them as an individual life. Jan was a hard worker, a strong husband, and loved to see his wife moving hay right beside him, her bare feet in the soil of the land. And their son Ryszard grew up in the heart of it all, a magical place of energy and caring that radiated warmth to all who visited. But war was coming, and its evil effects were inevitable. When Germany invaded Poland in 1939, Warsaw was bombed, including the beloved zoo. Buildings were destroyed, animals were killed, and those who ran confusedly free were quickly shot by soldiers. The Nazis rolled into the city and took complete control, claiming the battered zoo as a weapons depot, and taking over its operation. The animals were taken to Berlin by Lutz Heck, Hitler’s head zoologist, who believed he could breed aurochs back into existence. Meanwhile, under his very nose, the Zabinskis refused to be beaten. They turned what was left of the zoo into a pig farm to feed German soldiers, but also began smuggling in Jews from the ghetto, hiding them in cages beneath the ground, helping them to escape the brutality of the Nazis and their Final Solution. What an incredible true tale, a story of bravery in the face of pure evil and of a family who risked everything to do what was right. The Zabinskis saved over 300 Jews from certain death over the years, all the while putting their own children’s lives in danger every day. That kind of courage is only called upon during terrible times, but I don’t think that everyone has it in them to convert it into action when death is the punishment for discovery. The Zabinskis were simply heroic beyond measure, and although their effort saved such a small number compared to the millions who died, each life was a sacred thing being stolen away, each life saved was a miracle. Now back to the movie, which I have to say was mediocre compared to the actual events that inspired it. Most of that is because of Jessica Chastain, who has fooled so many into thinking that she is ultra-talented, when the opposite is true. She’s a one-note actress, made all the more apparent by the use of a fake accent, which hampers any actor’s ability to emote properly. She isn’t as strong as her preceding reputation, and the film could have flopped because of it. To say that the men saved the day would be sexist, but in this film Heldenbergh and Bruhl were the far more believable leads, perhaps helped by their actual accents, but I also believe aided by their superior talents. The film was fine, it didn’t feel overly long, I was interested throughout, but the majority of that was due to the reality of the situation, not by the work of the woman who was supposed to be the reason to watch. Video – With an aspect ratio of 2.40:1 (1o80p HD Widescreen) and shot using both Arri Alexa M cameras with Hawk V-Lite lenses and Arri Alexa XT Plus cameras with Hawk V-Lite, V-Plus, and V-Series lenses, the video quality of the film was top-notch. The colors were magnificent, the scenery was beautiful, the animals looked lovely, the costumes were cool, and the visuals of the majority of the movie should be commended. Audio – The Blu-ray was done in English DTS-HD Master Audio, with alternate choices of English DVS Dolby Digital 2.0 and Spanish DTS Digital Surround. Subtitles are available in English SDH, Spanish, and French. Also, menu button sounds can be turned on/off. The audio quality of the film was excellent, with a nice backing track and a strong balance. Extras – There are a few extras on the Blu-ray, if you were interested in learning more. There are 6 deleted scenes that can be played all at once or individually. 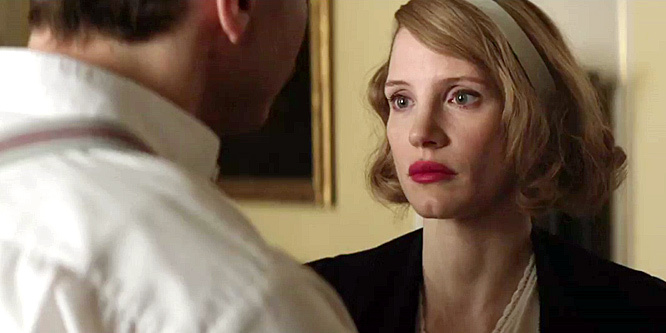 The Making of The Zookeeper’s Wife is a 7-minute behind-the-scenes segment. The Zabinski Family is a 4-minute featurette including interviews with the author of the novel and the children of the real life Jan and Antonina. And there are also 6 previews: The Theory of Everything, The Danish Girl, Hyde Park on Hudson, Loving, Race, Suffragette. Recommended. With this film, the content may outperform the delivery, but there are enough positives about the movie itself to warrant a watch, if not a falling in love. Chastain is the weakest link by far, and I wish that the critical and cinematic worlds weren’t so taken with her, that a different actress could have taken this role to the place it needed. Why not a Polish actress, there’s a simple question with a predictably complicated answer. Heldenbergh and Bruhl succeeded in part because they were more authentic, although the former is actually from Flanders, and the latter is half Spanish. They are simply more talented as well, that point should be made, and their screen time was of a higher quality because of it. The video was superb, the audio solid as well, and there are some special features for those who want more. Overall, a strong showing, a fascinating tale, just not a movie that will make an awards splash or be remarked upon often in the coming years.